This region is located in the northern part of the constellation of Scorpius, north of Antares. It is the brightest part of the great cloud of gas and dust that extends in direction east-west near the star ν Scorpii , north of the group of stars that make up the "head" of Scorpius. This cloud is illuminated in several places by different stars, becoming visible as many reflection nebulae apparently separated from each other. Among them is the cloud IC 4601 (see annotation map). The brightest part of this cloud is the reflection nebula vdB 102. 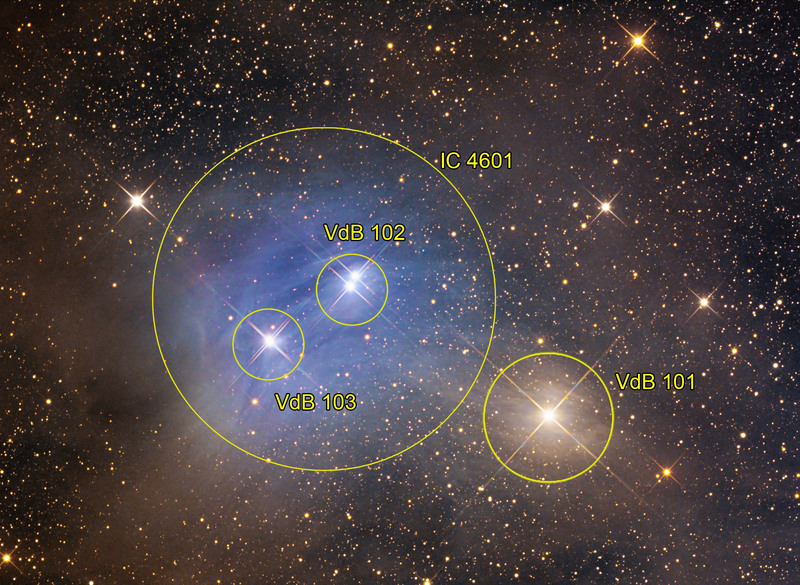 The stars responsible for the lighting of vdB 102 are known by the initials HD 147009 and HD 147010. The first is the less bright at mag 8.06 and is a white main sequence star. The second is a blue giant of spectral class B9III with magnitude of 7.40, which is also a variable from type Alpha2 Canum Venaticorum, with minimum fluctuations of the order of 0.045 magnitudes. Its variable star symbol is V933 Scorpii. The parallax of these stars shows a distance of about 143 parsecs (467 years light), similar to that of the Rho Ophiuchi cloud, a large nebula region with active star formation. A few tens of light years away there are rather massive stars belonging to the Association Scorpius OB2. 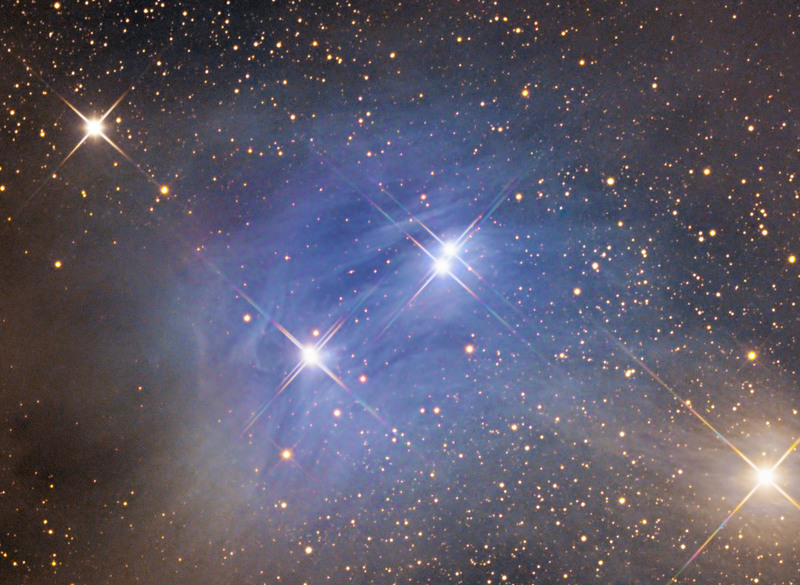 This OB association is coincident with a bright blue stars visible to the naked eye in the northern part of Scorpius.VdB 101, other reflection nebula is lit by the sixth magnitude orange giant HD 146834. This star has a spectral class K0III and is evolving towards the final stage of its life cycle, its distance, obtainable by measuring the parallax, is about 150 parsecs (490 light years). Physically this star is in an intermediate position between the Rho Ophiuchi cloud, and the stars of the Association Scorpius OB2. A widefield image, taken with the 16 " Dream Astrograph can be found here .